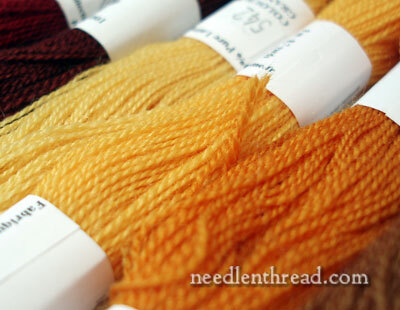 The threads arrived that I want to use for the Pomegranate Corners wool embroidery project! (Ain’t it great when thread arrives in the mail?) Once they got here, I sorted through them, change my mind a gazillion times, and finally make a few color selections. For this project, I’ll be using Fine D’Aubusson tapestry wool, which I tried for the first time last year, when it was first imported into the US. Fine D’Aubusson is made by Au Ver a Soie, and the approximately 70 colors that are currently available in the US match the color-number system of Soie d’Alger, I believe. So, for example, 916 in Fine D’Aubusson is the same color as 916 in Soie d’Alger. I may be entirely wrong about this – I’ll double check it – but from what I understand, this is the case. 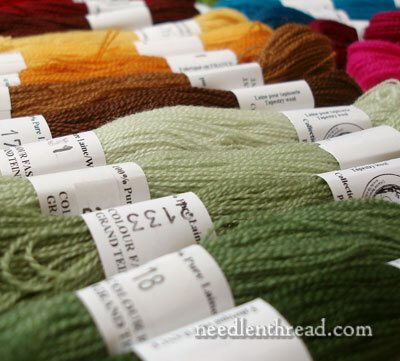 The thread, weight-wise, is finer than DMC medici, and the Fine D’Aubusson (which I would abbreviate into “FDA” but I’m afraid everyone would think it could be ingested…) is not a super-fuzzy wool. The twist is tighter and “cleaner” than Appleton, for example. This makes it an exceptionally good thread for stem stitch, chain stitch, and similar line stitches, especially when wanting fine, clean lines, and it works very well with satin stitch. But the lack of fuzzy softness that we might associate with most embroidery wools makes the thread slightly less forgiving on long and short stitch. That’s not to say it doesn’t work for long and short stitch, and I am planning on using long and short stitch on the leaves in this project. If you’re interested in stitching along with this, and using the same supplies I use, you can find Fine D’Aubusson available in the US through local or online needlework shops that carry goods from Access Commodities. Overseas, look for shops that carry threads from Au Ver a Soie. The yellow-golds are the bright and lively colors in the bunch here. They range from a lighter golden yellow to an orangy golden yellow, to a deep brown. I like these colors together! Initially, I thought about going with yellow-greens, but they I changed my mind and stuck with these more subdued greens. I’ll keep the brighter ones for a different project I have in mind! Besides the yellows-to-browns and the graduated shades of green, I’m using a selection of reds that range from a bright red to a deep burgundy. 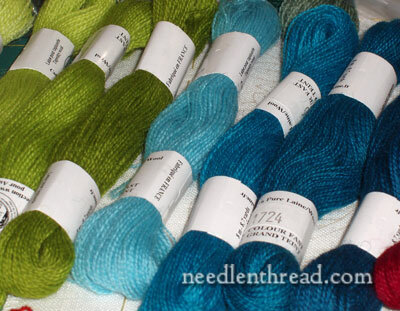 Speaking of original color choices, I was going to go with the yellow-greens and the new blues that are now available in the Fine D’Aubusson, but….. I’m saving those for that other simmering project idea! I’ll be setting up a permanent index for this project tomorrow, so you’ll be able to find it under Tips and Techniques after that. Now…. to get some dedicated stitching time! Maybe this weekend? Here’s hoping! I don’t use wool very much in my embroidery but those look very nice and the colours are very, very yummy. That wool looks absolutely beautiful. Old fashioned as petit-point purses are I think it would be fun to do one with those wools just because they are fine. Also, they would probably look great embroidered on cotton velvet. Can’t wait to see them on the linen. Thank you for showing your color selection. Am I right in thinking that… you have an idea of the colors that you want, you order some colors from the color family, and then you finalize your selection. I have all these ideas in my head of projects that I want to start but I get stuck on what colors to choose. When I learned to embroider the colors were always chosen by my mom or by the company that produced the project. 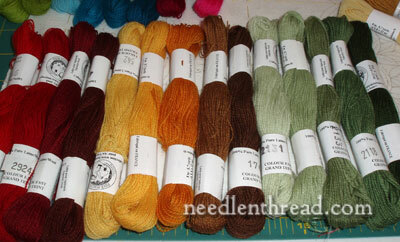 Now that I want to try my own projects I find it difficult to choose the colors and end up using white. Knowing how someone chooses colors is a very helpful! Sharon – Thank you for helping out! Yes, I think you have more of the Fine d’Aubusson available to you than we do here! Lucky duck! RM – With this project, I have all the colors of the Fine d’Aubusson to choose from, and I had a general notion of the three colors I wanted, then I sorted through the wool to pick out the ones that would work best together. I actually had a bit of hesitation on the greens – I thought about going with the yellow-greens, but stuck with the others in the final decision. Anyway, I had already figured red, gold/yellow/brown, green for the project, so it was a matter of narrowing down the colors and shades I wanted to work with. It doesn’t always go like that, though….! Hi, Jacquelin – yes, I think you’re right – it would be a nice wool to work petit point in. I like petit point! It’s old fashioned, but it can be very beautiful…. and it is sturdy stuff! I have a footstool I’d love to recover one day in a petit point design. Hoping to get some stitching time in tomorrow on the wool project, so by Monday, maybe I’ll have the first bit to show you! I looked at your selection and thought “what a beautiful Elizabethan palette” ! Were Can I purchase wool floss for punchneele embroidery? Hi, JC – not sure, as I’ve not used wool for punchneedle. I’ve used cotton, but not wool. Maybe someone else will know and answer? Your work is very beautiful. I use wool and I use what I do. It’s fluffy, colorful and really beautiful. I just post in G+. Thanks for sharing such a beautiful work.